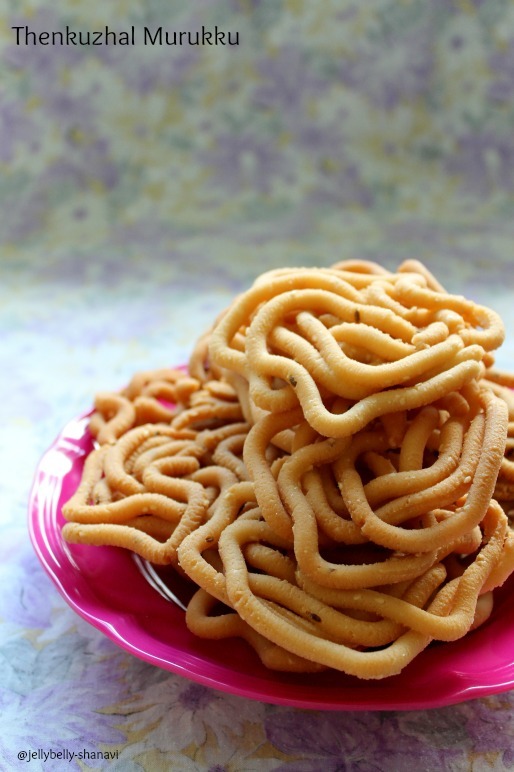 Thenkuzhal is such an easy recipe where u don't have to worry about the shapes and the fun part lies in drawing the murukku. 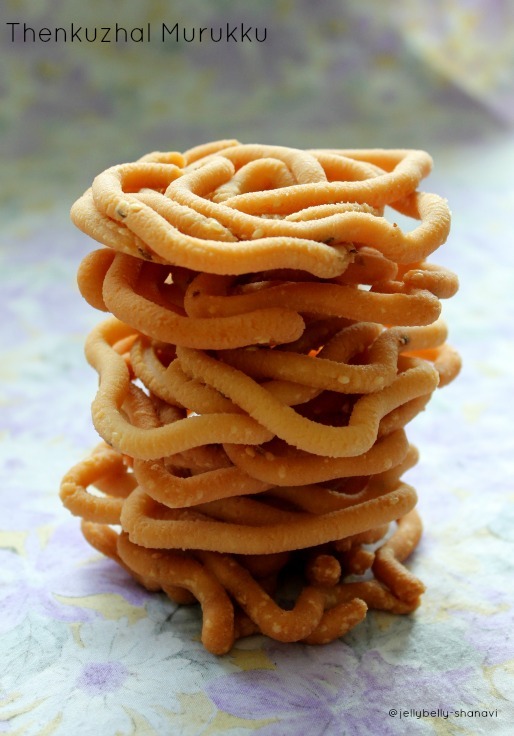 My mom would make it well ahead of Deewali, me and my bro would enjoy munching the crispy,crunchy murukku after our school hours/college hours. I'm so glad that my murukku turned out well. So, have u guys started making savories? Dry roast the urad dal in a pan until it turns golden brown,cool and grind to a fine powder,sieve the powder and remove the lumps. Transfer the flour to a bowl. If using store bought urad dal flour,dry roast the flour for 2 minutes over medium low flame and transfer to a bowl. Heat the oil on medium flame for a minute. Take 4 1/2 tbsp of hot oil and add it to the flour. Switch off the heat later. Add the rice flour to the urad dal flour, add hing,sesame seeds,cumin seeds,salt and butter. Leave the flour for a couple of seconds and then make a soft but not sticky dough. 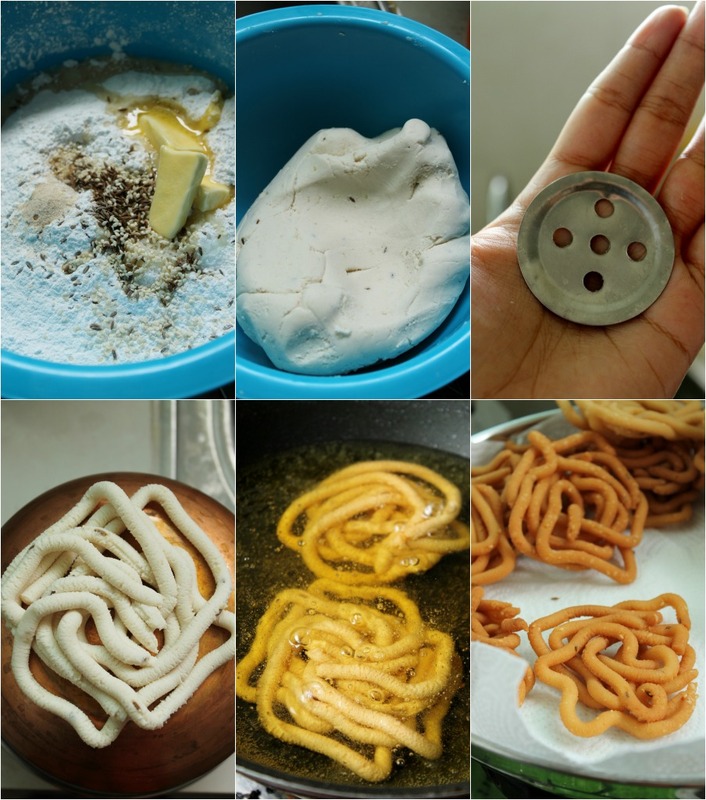 Take a three hole disc for making murukku (I had 5 hole disk only) and stuff the dough inside and make the kit ready. Grease few flat big spoons/ vessel with oil and draw murukku. Now heat the oil on medium flame and add the murukku slowly when the oil is hot,not smoking hot. Cook the murukku undisturbed for a minute, flip the murukku, cook the other side. Repeat the same until the bubbles around the murukku seems to be almost gone. Take out the murukku, drain, place in the kitchen tissue. Repeat the same procedure until u r done with the remaining flour. Store in air tight container when cooled. Oil should not be too hot for making murukku. Oil has to be hot when adding the murukku(dough) ,after a minute,reduce the flame a little lower and cook . Do not crowd the pan. Add 2 if ur pan is small. If the oil is too hot then ur murrukku gets brown soon but inside might not be cooked. Let the murukku comes to room temperature before storing. 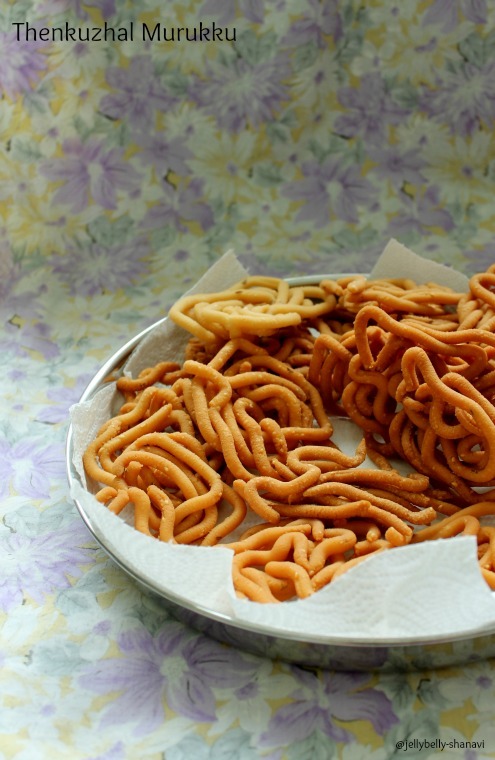 This is exactly same way my grandma used to make murukku.. Loved your presentation too.. Happy diwali di.Love the murukkus.Planning to prepare this today . WoooW..Kudoss to your work Sho..I am impressed in your work..Super tempting Clicks..
Ooooo... I m bookmarking..definitely will try..awesome. 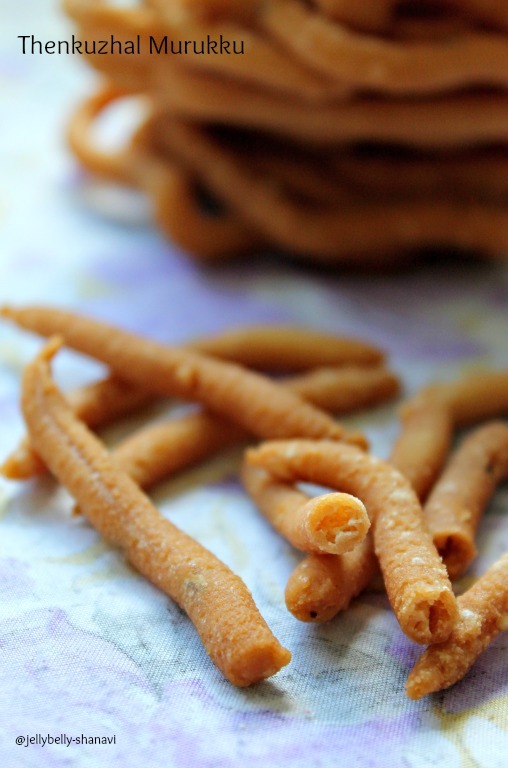 Crispy and delicious snack,love all clicks especially last one,love this. 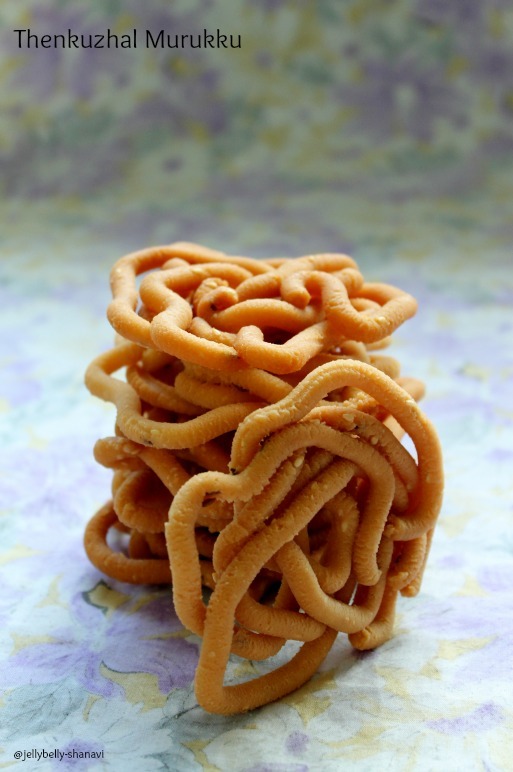 Feel like munching some, my fav murukku and yours looks simply fabulous.